James Sadler Hamilton has spent over thirty years studying the music of South Asia, including fourteen years while living in India (1976-1990). He has acquired an indepth knowledge of traditional Indian music, studying music history, theory, and a variety of musical genres including North and South Indian classical, folk and devotional forms. Sitar Music in Calcutta: an Ethnomusicological Study reflects the author's involvement with sitar music between 1975 and 1986. His studies took him to India where he learned privately with renowned musicians and musicologists, including Radhika Mohan Maitra and Ms Kalyani Roy. In 1979, he completed a Master's Degree in Instrumental Music (sitar) from Rabindra Bharati University in Calcutta. In order to further pursue studies in this field, he undertook a PhD program in Social Anthropology (Ethnomusicology) from Queen's University, Belfast, N. Ireland, which he completed in 1987. While at Queen's, he was advised by Dr John Baily and Dr John R Blacking. The author has lectured and performed on the sitar in India, Canada, the United States and the United Kingdom. 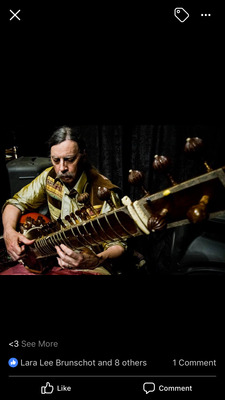 He currently devotes his time to sitar performance in the Vancouver, B.C. area. He is the house sitarist at "East is East" and also performs with the electronica group Shamanoid. Recently, he has engaged in collaborations with the renowned concert pianist Yaroslav Senyshyn. Sitar Music in Calcutta; an Ethnomusicological Study University Calgary Press, 1989. An Ethnomusicological account of the relationship between Indian modes of perception and the development of the sitar and its classical music repertoire. Sitar Music in Calcutta; An Ethnomusicological Study (reprint) Motilal Benarasidas, New Delhi, India 1994. This edition of the book is only available in India. The lines of argument are clear: the "Indian mode of perception" explains some aspects of the social organisation with interesting parallels in musical structure, notably in Ragang classification of Rag. Background information on the Gharana system is also provided to place the two chosen Gharana-s of Calcutta in a broad context. This is a model ethnomusicological approach. Dr Neil Sorrel (York University, York, U.K.). Although the importance of ecoles (schools) in transmitting sitar music has often been stated, previous studies have tended to be either descriptions of status quo, musical practices or sociological descriptions of institutions without taking into account the analytical aspect of music. This manuscript is virtually the first attempt to combine these two aspects organically so that the differences of ecoles are examined not only sociologically, but also interms of musical structures. The author has succeeded in this attempt by experiencing and emphasising the learning process in music. Without such emperical experience, he would not have access to a large amount of important information which clarifies the functions and characteristics of the ecoles. Thus he has succeeded in amalgamation some aims of various aspects of musicology such as the study of musical structure, history and music in its social contexts. I consider the author's scholarship to be sound. Not only previous researches in Western lanuages but also many contributions by Indian scholars are fully utilised. A more important contribution consists in his method of explicating the consciousness of Indian people, particularly, Indian musicians... It should also be mentioned as one of the manuscripts sound characteristics that iconological sources are amply utilised. It is a very impressive work and a major contribution to the literature on the music of India... it is clear that this is a scolarly work in depth and that Mr. Hamilton is very well informed. The manuscript...makes a vital contribution in its thorough background and attention to detail, definitions, and explaining of aspects which would be taken for granted by those living their lives in the tradition but which anyone else would need to learn in order to understand this tradition...it (Sitar Music in Calcutta) could well serve as a basic resource in scholarly research in ethnomusicology as well as provide the educated, interested appreciator with the more detailed analysis which is often craved but unavailable in so many areas of study and appreciation. In many respects James Hamilton's book is a well-documented and well-rounded work making use of past and recent academic research in Indian Musicology, intersperced with anecdotal information and personal experience in actual instruction received from prominent figures in two major gharanas. The study over-reaches its Calcutta boundaries in its attempt to provide an all-encompassing macrocosmic overview of the ethnography and history of instrumental music in North India. The chapter on the Ghalam Ali Khan sarod gharana is a most interesting and original coverage of a rarely written-about topic, perhaps due to the author's own bias and gharana affiliation. Besides the history and various genealogical charts, we are made privy to the inner secrets of this gharana, baj, chal and teaching method as well. On the whole, this is a book by one who obviously had experience in learning Indian music and the sitar, and has done a good deal of thinking about Indian culture. It can be read for the enjoyment of sharing the author's ideas, and the patient and careful reader might extract some interesting information on sitar style. Hamilton's scholarly ethnomusicological study of the sitar considers the instrument and its major innovations within the context of India's culture and heritage. This very technical coverage reviews complex musical theories and sitar development, offering an in-depth, college-level focus which will particularly appeal to advanced students of the instrument. The inclusion of charts, musical scores and genealogical records of major sitar players makes for many graphic illustrations of terms and concepts.